Officially licensed hard hat with your favorite logo. This Fresno State Bulldogs Hard Hat meets the requirements of OSHA as per ANSIZ89.1-1986 class A and B, and ANSIZ89.1-1997 Class G and E standards. Features adjustable headband for sizes 6 1/2" - 8". Provides tough, lightweight protection with a patented shock absorbing suspension. 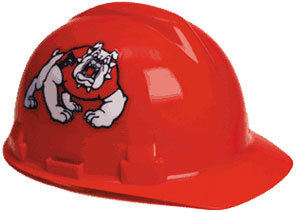 Support your favorite team with a Fresno State Bulldogs Hard Hat. *** Please note that the image shown may differ from the actual Fresno State Bulldogs Hard Hat due to manufacturer changes.